Missing some definition files, the res.mip is just a load of images all together, there should be another file with their locations and sizes. I get the feeling there's one for the script too. By me TOC in the beginning of res.mip and is crypted by some blowfish (or maybe just a simple xor)... Which you never know, unless you hack original game to see how it load file (well, if this is xor, you could try to figure it out without original game, but I does not posess such skills). It's a simple xor with 0xFF. The res file is just a whole list of PNG chunks together. There are three discs for the game, one for installation, one to play and another for the music. I'll upload the discs so you all can access them too. You can only see music files on the play disc so the rest may be hidden. The image below is from the main directory so the other files may be on the play disc. Btw could whoever looked inside the files I uploaded upload whatever was inside the res.mip and sc.mip. Don't know if links are allowed but here's the PC version of Bittersweet Fools. What tools did you use to do this? My own, it's really not too hard to just xor a file with the same byte. That will extract all the images from res.mip, and it'll give you the xor'd version of both res and sc. Run it as "BittersweetFools.exe res.mip" or sc.mip. It crashes when I use it, I'm on Windows 8.1 by the way. A guy on 4chan gave me this to get the images out from the res.mip file, but it's python and I've tried to get it working. Can someone help me out? I've decompressed the games images, now I can start recreating the game. Okay, I am completely new to this (hacking, translation), I wanted to give it a try, but I am stuck. I looked at various sites and read through this topic, too. 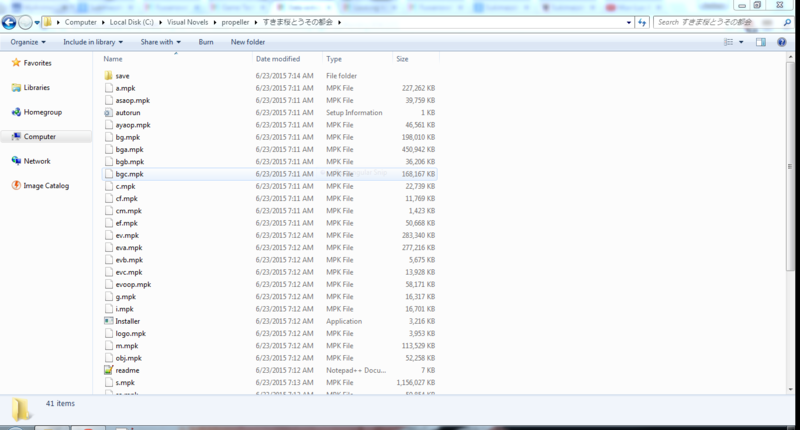 So, I have a Rio.arc file that I managed to extract using asmodean's tool, and I got a bunch of .ws2 files. I tried to edit them in HexEdit, but I have no idea what should I do exactly. I was wondering if someone could tell me how could I turn those files into modifiable ones, if possible. And how to turn them back so I wont have to ask next time, if there will be one. Here's a tutorial (well not really one) i made awhile ago, Pretty much ROL(Rotate Left) it by 0x06 to get editable text, then ROR(Rotate Right) it by 0x06 to get it back to normal. EDIT: I'll have to make one for HexEdit, it's stuff will probably be located somewhere else. Here are the scripts if you want them. I got 010 Editor and managed to rotate left, and I edited the first file (sk_01.ws2). However when I rotate it back right and create an archive using AE with every original file + the one modified one, I get a Rio.arc open error even though I only changed a line and I rotated right at the end. Ok, I had problem with encrypting formats. I got it now.. It's a binary format, it's not meant to be edited directly with a text editor. Kelebek, do you know what character encoding is this? http://psp4real.ru/_tr/scenario.civ (chunk starts as 0xFC0, text somewhere 0xFDD, that 0x48 0xF9 seems a ━ (long -)). As does not look like Unicode or Shift-JIS or any other. Aren't they encrypted? Doesn't look like any format I know. This is windows game, and it uses windows built-in fonts to print, so... Quite strange. Hey everyone. I'm looking to extract the text/script from Fortissimo EXS. I've already tried using both Crass and extract data. The only thing Crass manages to provide me are with CG rips. At this point of time, I can't even find out the location of the script file (and no script has ever been extracted even if I've tried to extract the correct file). If you need more information, then here are some images of Fortissimo's directory. Could somebody please assist me on addressing this matter? Thank you. Upload the MES folder (archived of course) and i'll help you get the text. Hello everyone, I was hoping to extract the scripts from Sukimazakura to Uso no Machi. If perchance someone is willing and able to help me, would a script of some sort be possible to automate the reinsertion of text? Either way, thank you in advance. Upload the scenario.mpk file, i'll have ago at it. Have you tried using crass or AnimED? Extract a data.xp3 by AnimED. Message is "Cannot open the file. make sure it is not used by other application"
Extract a data.xp3.sig by AnimED. Message is "Archive is broken or unsupported". .sig just means "signiture" nothing important to it, you can just open it in notepad.